Guess who we have for the handsome today? Well, you may have already seen the title. That's right - Aaron from Design*Sponge! How fun, I mean I think we'd all agree Grace is a rock star in the blog world so it's so lovely to have her husband sharing with us today. Enjoy! Please tell us a little about you and what you do: I work on Design*Sponge as the Director of Advertising and Business Development. I oversee our ad sales team and help manage our business partnerships, which allows Grace to focus on what she loves and does best, which is produce great content. At the same time, I'm also working with a company that specializes in Poker Training and education - helping them launch an online poker education site. As it turns out, I am a complete work masochist. What are your thoughts about blogs + blogging? I love blogs and blogging, and I read them all the time. They're a fantastic way for people to stay connected to fields or communities they care about. How did you & your wife meet? Grace and I met during the brief window of time that "Friendster" was a word people used. We had a mutual friend, and that friend set us up on a date. We went out to dinner and have been together ever since! How many hours a day does your wife spend blogging? Hmm, how many hours are there in a day again? Let me think, well she doesn't spend ALL day blogging because she also spends time on Twitter. But when she's not on Twitter, she's definitely working on the blog. I'll put it this way: there may be harder working people on the internet than Grace, but I've never met them. What do you do during this time? Sadly, I'm usually working, too. We're pretty boring. We spend a lot of time side by side on the couch, each on our laptops. But when I'm not working I enjoy reading, playing poker, playing video games, and playing guitar. Any silly/crazy/funny/cool stories or experiences related to blogging you'd like to share with the readers: Not really - I still think it's cool meeting people who read the site, and I still get weirded out by the fact that they know about a lot of basic details of our life, such as what furniture we have, or trips we've recently taken. So when things will come up in conversation, I say things and I get a lot of "yeah I know!" - which still surprises me even though it shouldn't because Grace writes about a lot of this stuff on the site. Is there any one thing that annoys you most about having a blogger wife? I'd say the only thing that's vaguely annoying is trying to explain what it is that we do to people we meet. It takes a lot of people awhile for people to understand/believe that it's a real job. Not a bad problem to have, but it's kind of funny when you work really really hard on stuff, and then when you describe it to someone, it really just sounds like you have no job and are completely making up what you do. Please be sure to leave a comment and show our men some love & support! Be sure to check out the old archives of The Handsome here! If you have a request or there's someone you'd love to see up here on the handsome or if there's a question you're wanting to ask the guys, leave a comment and let me know! In the second picture he looks like Paul McCartney. I LOVE that you got Aaron here on The Handsome! "Rockstar" really would be the exact right word to describe Grace :) It really is so much fun to read these mini-interviews with the men! Love this series. It's nice when people support blogging and it is so tricky to explain that it's actually a real thing to do! i love grace's blog, found it out just a few weeks ago and since I am a full time "wanna change the look of the apartment" lover i loooove her blog with several DIY ideas! What a lovely series. :) I can definitely relate to that last answer. I just adore this series. And they are such a great blogging power couple. Blogging is so hard to explain to others so it's so neat that they have that special bond. Lovely, open answers to your questions. I really do love this series - so cool! Hahah that's pretty good! I kind of feel the same way when I try to describe what I do to people. Although I'm really not of the same calibre, it's just a funny thing to have to explain to people! I wish my husband and I would have a job where we could be together and work on something together! You guys are so lucky! And I love your website! HA! my hubby has the same problem when trying to tell people what he does!! I've been reading Design*Sponge for so long and I had no idea Grace's husband worked on the site, too! That is so cool! 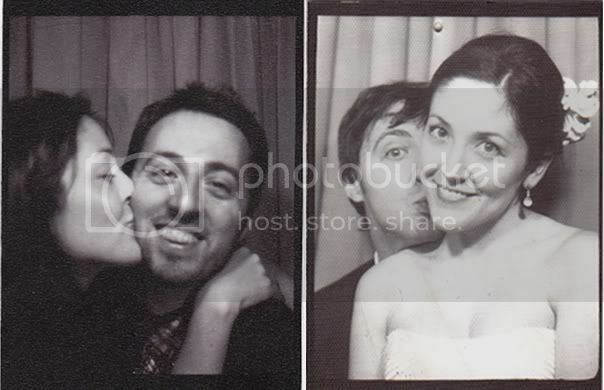 And I definitely agree with Katie that, in the second photo, Aaron looks like Paul McCartney. Super cute photos, by the way! This is so awesome and I really love this feature! I was just teasing my husband that he's next so he better prepare his interview answers. He said "I wouldn't want to have to admit that I don't read your blog! Well, I do actually somtimes read it..."
I just had to explain to the grocery store clerk what my "job" is and I had a hard time explaining it - it felt so awkward! So I am totally relating to what Aaron said about trying to explain that it's a real job and not some fake thing that's totally made up. Hahahaha. I am love love LOVING this series. please keep them coming. these features have got to be one of my all time faves in the blog world right now danni!! i love hearing about the men behind these amazing women!! thank you for this! I love that you are doing these. Such a FRESH addition to the female blogging world. I think sometimes it feels like the guys get forgotten a bit or are just characters/accessories on the blogs. It's fun to see them in person. Fantastic idea! You Know Dani, I really dont like reading interviews.. i know.. I'm a weirdo... BUT i L.O.V.E reading THE HANDSOME!!!!! I look forward to it every time!! This is a really great series, Dani. Thank you for sharing this. I love to hear about other couples also spending hours side-by-side glued to their laptops. I'm not alone! Wow! I looked through the archives and this is such a cool series! Very creative idea. This one caught my eye especially because I've been reading Design*Sponge forever (even though I'm super new to blogging myself)I'm glad I recently came across your site as well! Looking forward to more!